The Eagles’ nest will have a new face soon; a new project to enhance Florida Gulf Coast University’s entrance, at FGCU Boulevard and Ben Hill Griffin Parkway, kick-started with the beginning of construction a couple of weeks ago. According to Tom Mayo, director of facilities planning, the construction budget is approximately $1.5 million and will be entirely funded by the university. “The project is intended to create a welcoming entrance that is more monumental and is distinctive to FGCU,” Mayo wrote in an email. A monument tower with the university’s logo will be set on the north corner of the entrance, while a monument sign that will read ‘Florida Gulf Coast University’ will be placed in the FGCU Boulevard median. The enhancements will also include new lake fountains and landscaping. “The tower and median sign designs are bold and elegant, contrasted by all native species landscaping to enhance the subtle, natural character found throughout our beautiful campus,” Mayo wrote. According to Mayo, the project was initiated by the university president, Dr. Bradshaw, about a year ago. Artist’s rendering of the future entrance. The design was developed by the design team of Studio+ and Waldrop Engineering with the leadership of a committee made up of University faculty, students and staff, and included the landscape expertise of George Fogg and Mike Brower. 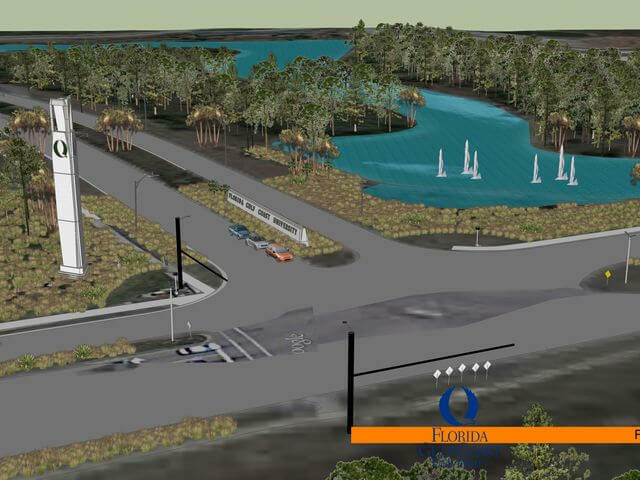 The project’s area of improvements is confined to the previously developed right-of-way along FGCU Parkway. The completion date is set for mid-August, just before the start of the fall 2015 semester. The university’s project will run concurrent with an underground utilities project by Lee County. This project by the county will run on the right-of-way of the east side of Ben Hill Griffin from the north entrance road to the main entrance road. “We are coordinating with Lee County staff to help both projects run smoothly throughout construction,” Mayo said. Other than some occasional lane closures on Ben Hill Griffin parkway, the Lee County project will require closures of FGCU Boulevard during the evenings for the first two or three weeks until the county project moves from the entrance area. FGCU Boulevard will remain open to vehicular and pedestrian traffic during the daytime hours. PreviousDeflategate, is this the marking of a new era for the NFL?